For over five years the Trust board have consistently met on a monthly basis, to discuss all things Swindon Town. 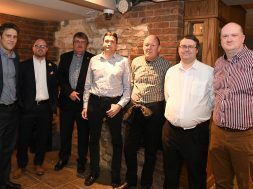 Trust Chairman Steve Mytton with news from the latest board meeting… . Last night we held our January Board Meeting and we were joined by Hannah Clinch from the Swindon Town Supporters Club who we invited along as part of our efforts to bridge the gap between our groups. Ten board members were in attendance, with one absent due to illness. Treasurer Alan Jones updated those present on the latest Trust account balances, where we have approximately £62k in the bank. £500 had been transferred to Supporters Direct for costs associated with creating a Community Share Offer document (CSO), however no other significant costs had been incurred throughout the month. You may recall that back in January 2014 we successfully applied for the County Ground to be listed as an Asset of Community Value (ACV)…. (if not, you can refresh your memory by clicking here). The status is valid for five years and hence it is now due for renewal, which we discussed in earlier meetings and decided to press ahead with. Secretary Cliff Ponting updated the board and advised that former Board member Ron Smith had submitted a request to Swindon Borough Council for the renewal on our behalf. The documentation has been accepted as legitimate by the Council’s Planning Department and will now be reviewed before the extension to the ACV is granted. This will not impact the sale process but does provide an important safety net in case anything doesn’t go to plan. We had discussed at our December board meeting how to get greater participation in our TrustSTFC.tv website, and we actually made some progress, even though the weeks inbetween were dominated by Christmas and New Year Activities. ‘Dan the Fan’ found a new home on our website courtesy of Trust Member and Red Army Fund contributor Dan Johnson, who has supported us for many years. 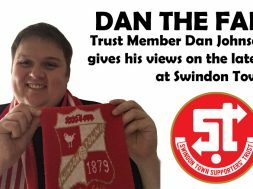 It’s really great when people take their own personal time to contribute to the Swindon Town debate, so thank you Dan. If you have something on your mind and can put together an article either as a one-off or on a more regular basis – please get in touch. You too can have your own regular column! Discussion then moved onto the County Ground project where Vice-Chairman Rob Angus, James Phipps and myself all gave updates. Throughout December and early January there have been a number of one-to-one phone calls, conference calls, face-to-face meetings, as well as the usual WhatsApp and text message conversations. Our board meeting is a chance to bring all of that together and discuss as a group. I know from feedback on the last Board Meeting summary that some of you remain frustrated at the lack of detail we publish, and all I can say is that I know where you are coming from, and share that feeling too! There are no great secrets that you are missing out on, and I can assure you that we are getting to ‘the business end’ of proceedings. I am hoping that in the next couple of months we can bring this to a conclusion and bring you some really great news. Please sit tight, just a little while longer…. It’s important that we maintain a positive relationship with the Football Club and I’m delighted to report that things are going very well on that front. Swindon Town’s Non-Executive Vice-Chairman Clem Morfuni resides mainly in Australia but is always very easy to get hold of and we have regular conversations with him. He’s in the UK every month generally. Clem is a nice chap and despite being an Aussie, has a lot of passion for English football. He brings a wealth of experience to the County Ground project and believes, as we do, that the stadium purchase could be the start of a new positive era for Swindon Town. Remember, the proposed purchase will be between Swindon Town Football Company Ltd (the football club) and Swindon Town Community Mutual Ltd (the supporters) and will protect supporters interests. No one person will have a greater say over anybody else and the ownership arrangement will be democratic. We want everyone to own a piece of the Stadium! Our board meeting lasted for two and a half hours, as there are many angles to cover and there is so much to talk about. It’s impossible to get all of that into a one-page summary like this, but hopefully this article gives you some idea of what’s happening behind the scenes. Remember! We just need a little bit longer, so please maintain your patience. If you have questions please feel free to get in touch, I will always give you a reply and give a little more detail where I can. 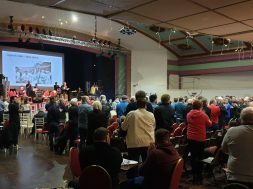 We concluded the meeting by agreeing a provisional date for our annual Trust AGM. We are just checking a few things out and will let you know as soon as that’s confirmed. We want a big attendance this year to follow on from the last couple of years, it’s really the best place to discuss things. Finally, please click on the video above to hear a quick meeting summary from myself and Rob Angus. It’s not the best but please keep in mind that it was recorded at the end of a very long meeting and a very long day!